I want to share with you my first Android game, Color Fold. 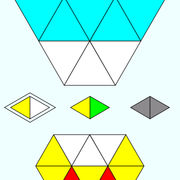 A simple puzzle game about swapping, folding or duplicating coloured triangles. 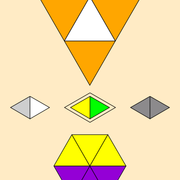 Objective of the game is to reach the solution by changing the puzzle triangle colours in given number of steps. 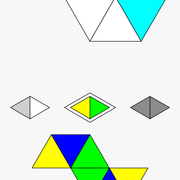 Colours of the triangles in puzzles can be white, yellow, green, cyan, blue, orange, red, purple and black. White has a colour value of 0, yellow 1 increasing to black being 8. 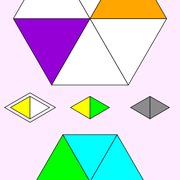 - Swap colours : This will swap the colours of two chosen triangles. - Divide/add colours : This movement will divide the colour value of chosen triangle and add it to target triangle. Move is not allowed if result colour value of the target exceeds 8 (black). Some of these movement types may be disabled for a specific level.